Brush and spray is a maintenance process used to clean and protect oil country tubular goods. We brush the outside of tubulars by helically conveying them under a fixed rotating brush head to remove rust and scale from the surface. 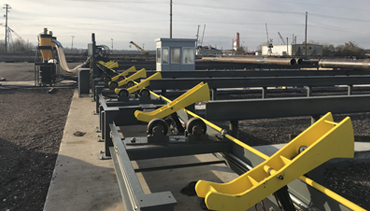 Patterson Tubular Services (PTS), Morgan City, recently commissioned a large OD brush machine capable of brushing 15 to 30-in. OD tubulars, ranging from 20 to 62 ft, and up to 31,000 lbs. Depending on the material of the tubular, as well as customer requirements, either a wire brush or a synthetic nylon brush is used. Tubulars can be sprayed with an environmentally friendly water-based varnish for long-term protection. Brush and spray services are frequently coupled with ID brush, full-length drift, visual condition check, and/or clean and re-dope services. First implemented by PTS, our rig return program is an economic and efficient method to restore tubulars to useable or sellable condition to help reduce unusable inventory. This service includes a visual condition check, thread inspection, full-length drift, and clean and re-dope. Internal diameter spot grinding is an available service to restore tubulars in accordance with API requirements. Reflectors can be removed from any location along the ID on sized down to 4.5-in. OD. This is an economical option to restore rejected material to prime condition.